On Friday, October 26, the 2018 Voodoo Music + Arts Experience kicked off in City Park in New Orleans. There, tens of thousands of music fans ranging from candy kids to ’90s alt rock fans and vibrant hip-hop heads descended into the muddy grounds. We checked out performances from Third Eye Blind, The Revivalists, Smino, Rufus du Soul and a headlining closer from Mumford & Sons. Below, check out our thoughts and photos from Day One. During an hour-long set, Third Eye Blind performed “Graduate,” “Faster,” “Wounded,” “Never Let You Go,” “Losing a Whole Year,” “Jumper,” Motorcycle Driveby,” “Company of Strangers,” “Semi-Charmed Life” and more. Voodoo was just a stop on their current tour, which takes them to Florida before the weekend is out. But they certainly revived any sleepy heads at the festival this year before heading out, as expected, with the classic jams heard clearly from the festival gates, they beckoned long time local fans from afar and kicked off our weekend in classic homestyle fashion. 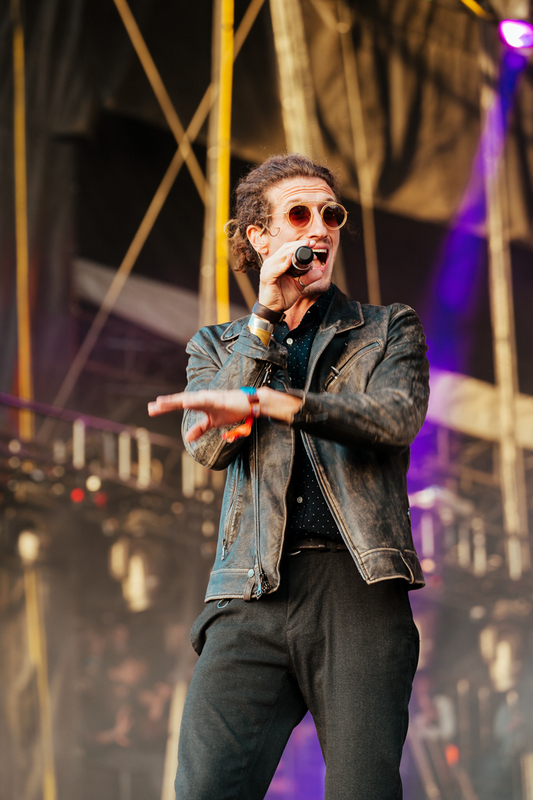 Despite being sandwiched between Third Eye Blind and A Perfect Circle, which is quite the eclectic rock line-up for one stage, the crowd was strong and worked together to usher in this new album with no shortage of enthusiasm and support. A proper send off from the hometown and proper start to one of New Orleans’ favorite festivals. It was off to the South Course stage as the temperature dipped a few degrees to see Smino, a St. Louis rapper-singer hybrid who shouted out OffBeat on his Instagram Story. With his signature twang, fly kicks and styled hair, he delighted a young crowd with a stage presence belying his relatively fresh career. He’s been releasing music since 2015 but it was arguably 2017’s blkswn that placed him on the proverbial map. His appearance at Voodoo Fest was somewhat of a fluke. Thanks to an unfortunate cancellation by another rapper-singer hybrid, Goldlink, Smino flew into town for a stripped down set. With just a DJ and laptops behind him (in place of a live band, which he has performed with in the past), he was fantastic. Rufus du Sol closed out the South Course stage at this year’s Voodoo Fest just the way we wanted them to: strong energy, stable stage presence, clean sound and continued dance vibes for a full 60-minute set. And, we lucky festival goers got to catch them mid-tour as they celebrate the release of their new ablum, Solace, which only just dropped on October 19th. They’re off to Texas next, but their Friday night set featured the notable tracks from this new release, including “No Place,” which felt eerily familiar but beautifully unique. Fear not, die-hard fans: the new release did not mean we lost all of our oldies but goodies in the set list. Within 20 minutes, we had “Innerbloom” from their 2016 release in all its glory, ushering the crowd into the bouncy bliss that we also know to be characteristic of the Voodoo vibe. They made the perfect headline to the South Course stage, set up by the likes of Ravyn Lenae and Smino, leaving the crowd primed and ready to head off to Zeds Dead in full festival fashion. It was like a muddy tailgate party, and no one cared about the mud. If you missed it, you can catch our Australian buds on the road. Next stop: Houston. That’s not that far from New Orleans, right? Get it while you can, because after their westward way they head off to Europe, and if tonight was any indication of how this tour is gonna go you won’t want to miss the best dance party 2018 has to offer. Has it been over ten years already? Mumford and Sons have been making people cry and think more deeply about their personal situations for a long time. This British four-piece shut down the Billboard on what feels like yesterday with their heart melting (breaking?) folksie tune “I Will Wait” from their 2013 release, Babel. Despite actually hearing show-goers singing this song while traipsing through the mud to get to the Altar stage for the headlining act, it didn’t make it to the set list. There was zero disappointment from the fans, and that should tell you something about the decade of music and performing these raspy voiced angels have brought to us. If I failed to mention that there was a runway on this stage, it’s definitely worth noting that Mumford made amazing use of it. In fact, they opened with Marcus drumming in what felt like the middle of the crowd, miles away from the stage, only to kick off a four-song streak of some semblance of the band being that close to the fans. I hate to say it, but it was dreamy, the crowd was intensely feeling all the feels under a big ol’ moon, and although we all have access to Setlist.fm, it’s also worth mentioning that they definitely played “Awake My Soul” and “The Cave.” Talk about ambiance. Ramping up for their Delta tour, starting November in the UK, these boys’ll be back on US soil come December, so if you missed it last night and feel like you need a long, beautiful, therapeutic cry, go snag a ticket and hang in there another couple months. Click through below for photos.